So, you’ve decided to learn how to strum a few chords, pick a few lines, shred a couple solos. Nice. Welcome to the club. Learning guitar is satisfying and enjoyable at any age. Playing guitar casually is my primary way to relax and de-stress. I just sit around and play chords. It’s amazing. Sometimes a song tumbles out. Like many players, I’m primarily self-taught, but I took lessons for about half a year, which gave me the footing I needed to get going. These days, lessons are easy to find, affordable, and flexible. Whether you want to find a local guitar teacher, find a remote teacher online, take online guitar lessons, or use one of the new online guitar teacher websites. 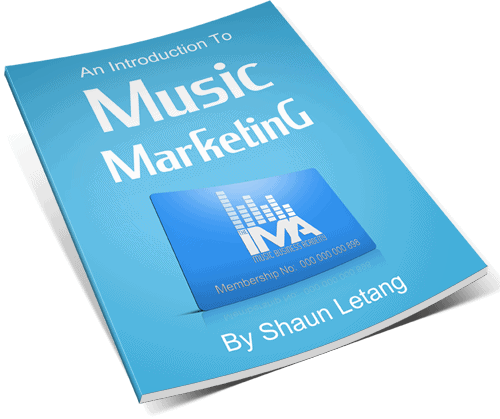 In this guide, we’ll take you through the process of finding lessons and figuring out how much they cost. 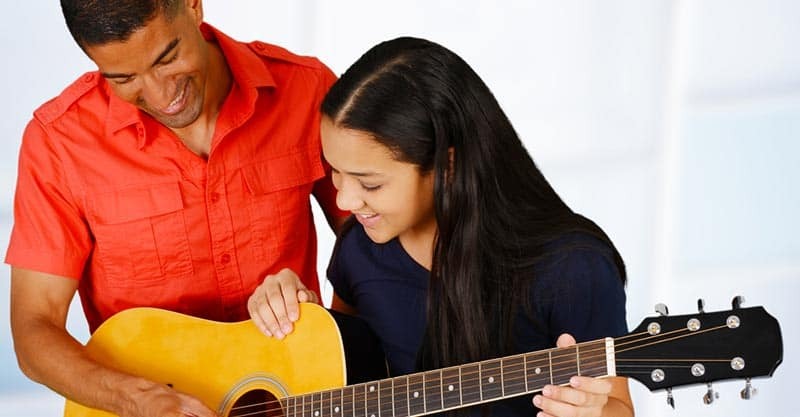 Worried About Guitar Lessons Cost? Mix It Up! Taking lessons from a local teacher is my favorite way to learn. There is an ancient history of guitar players learning from each other, stealing from each other, and even competing with one another. Taking some lessons from a local musician is a great way to get yourself playing the instrument, and it yields better results for many students. If you have a good teacher, they will inspire you to practice, teach you concepts in ways that work for you, and keep you excited about the instrument – tailoring your lessons to your needs. Having a real person keeping you accountable for your practice and progress is great. These days, one of the easiest ways to get a quality referral is to put out a call on social media. 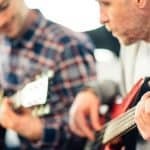 Post on Facebook that you are looking for lessons – you’ll soon have guitar player friends lining up to tell you about their awesome teacher. I like this, because based on what you know about your friends, you’ll be able to figure out which teachers are great. You may also find a talented friend willing to give you lessons for cheap! 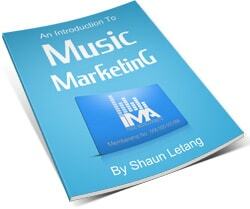 Music stores often have in-house teachers, or will be able to send you to some reliable sources. Be aware that local music stores don’t always hire the best teachers. They often hire teachers who are willing to work for less pay. But it’s probably still worth asking around to make sure the teacher you are going with is worth taking lessons from. Craigslist and Kijiji often have guitar teachers advertising their services. While this seems a little under the table, it can be a great way to find a teacher. Teachers will sometimes post videos or examples of their playing, and they are usually easy to get a hold of. A lot of the people advertising this way are full-time workers looking to make money on the side. So, how much do local guitar lessons cost? At a music store or for the average beginner/intermediate guitar teacher you’ll be looking at $20 to $40 for a half-hour lesson once a week. This is the standard rate, and beginner lessons are usually just half an hour. For hour-long, in-person lessons, you’ll be looking at $40 to $70 per hour. Often, people teaching out of their home studios will have cheaper rates, because they don’t have to pay half of their wage to the studio or to administrative fees. Another way to take lessons is in the comfort of your own home over Skype. With the advent of the internet and social media, there is a wide-open playing field of professional, often renowned musicians, teaching lessons via Skype. I have taken lessons from some well-known jazz piano players for around $80/hr over Skype, and it was fun! They get to know you, teach you a few of their moves, and otherwise comment on your playing. You can take one-off lessons like these, or you can find a consistent teacher who will do lessons with you every week. Try out takelessons.com, wanderingminstrel.ca, or skypeguitarlessonsonline.com. About the same as a local lesson, often slightly more if they are reputable teachers. You’re looking at between $30 to $50 for a half hour, between $70 and $90 for an hour. If you’re not into taking lessons, but prefer a more self-directed approach, you should consider trying an online guitar lessons video series. There are many, many sites that offer online guitar lesson videos for learners of all skill levels. Some of the most popular ones are JamPlay.com, Guitar Tricks, and TrueFire. You can see which is the best online guitar lessons in our comparison here. Generally, these will offer courses that you can buy, watch, and learn from. These courses will focus in on specific techniques and styles. Beginner lessons – teaching you the basics of learning the neck, forming and holding chords, note names, and more. 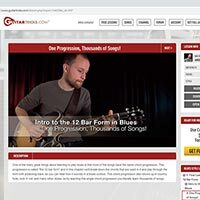 Styles – teaching you techniques and licks that relate to specific styles like the Blues, Country, Bluegrass, Funk, Jazz, or Acoustic Fingerpicking. Skills – learn how to tap, pull off great bends, have a nice vibrato, and more. Songs – learn how to play specific songs. 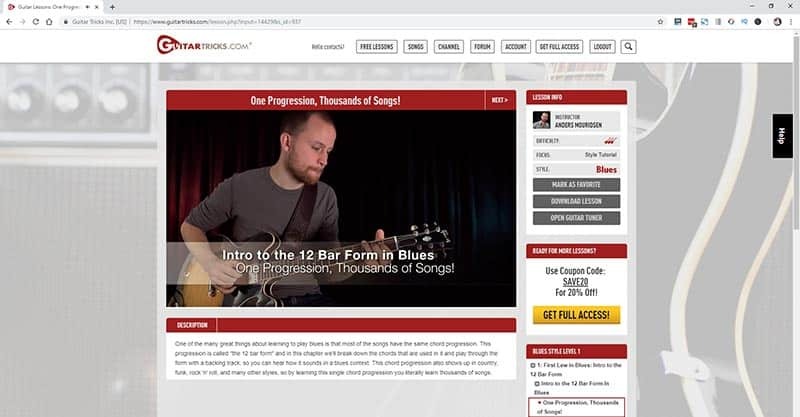 Often, these courses will teach you how to play a famous guitar song like “Voodoo Child (Slight Return)”, or “Pride and Joy”, or “Sweet Child O’ Mine”. Artist lessons – most websites also offer courses and lessons from artists you love. Famous side musicians who play for world-class artists offer lessons, and you can even find lessons from famous players like Derek Trucks and John Mayer. These categories and types of lessons are not exclusive to any one site – I just picked one. Almost all the good guitar course sites will have similar offerings. There are usually two ways of paying for these online lessons. You can either buy the course outright, or pay for a subscription which gives you access to a few courses every month. Generally, a premium membership will run you $30 to $60/month, but gives you access to more educational resources than you could realistically use for a month. Buying one course outright usually costs between $10 and $40. As you can see, this is the cheapest way to learn guitar. That said, this is only for the highly motivated. It takes a lot to sit down work out these lessons. It’s a lot of work and you need to keep on top of it for it to be worthwhile. If expensive lessons are causing you concern, don’t stress. Mix it up. Find a guitar teacher to teach you a few lessons and get you going, and then take a break. Buy a course, work through the course. Then, when you’re ready, book another lesson and get feedback from a qualified teacher. There is no right or wrong way to learn guitar. The only wrong way is to get discouraged and give up. People have been learning and teaching guitar for years. You can do it too!